Star of wonder, star of night, star of royal beauty bright. 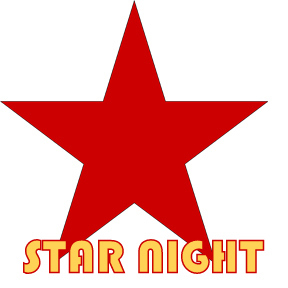 Have a star night celebrating Christmas. (bruschetta), Salad or soup of choice, Ravioli, and chocolate peanut butter pudding for dessert. Dessert Option 1: Make chocolate pudding according to package in one bowl. Mix ½ cup peanut butter (semi melted) and 1 tub of whipped cream in another bowl. (you can add more PB if you choose). Layer PB mixture and chocolate pudding in clear glasses (chocolate/PB/chocolate). Viola! Yummy fancy dessert. Dessert Option 2: make hot chocolate and using a small star cookie cutter w/ large marshmallows, cut out star marshmallows to put in hot chocolate. Add dollop of whipped cream. Using 10 craft sticks, glue sticks into the shape of a star. May use hot glue to speed up the process. Cover star in glue and sprinkle glitter on top to decorate. Tie a string to finished star to hang. Using star template, print 4 stars each of the 4 different colors. Cut out or have kids help you cut them out. Attach to floor with tape. Cut calling cards into squares and place body parts in one container and colors in another container. (bowl/hat/etc) 2 family members at a time can stand on game board. Caller will pull one card from each container and players must move according to the directions. Winner is the last one standing.